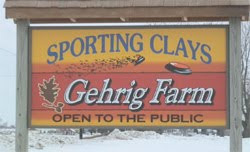 Gehrig Sporting Clays Course is located on the banks of the Rock River just off Hwy 14 between Janesville and Evansville. The course stretches across 100 rolling acres of woods and meadows and features 10-12 different stations that are reset regularly. Come take a tour of our farm and course and see why so many people come to visit us from all over Southern Wisconsin and Northern Illinois. Join us for league shooting starting April 23th, 2019 and running for 10 weeks. Shooters are allowed to shoot either Tuesdays or Sundays and the fee is $175. Summer leagues will be running for 10 weeks. Shooters are allowed to shoot either Tuesdays or Sundays and the fee is $175. Membership includes access to our stocked fishing ponds. Fish, swim or train your dog in one of our ponds next to the Rock River. Members are also welcome to use the property for walking as well as picnics and camping by the Rock River. - Memberships are $100 for the entire family. Please call the farm to make an appointment for camping and picnics. Have your next outing or fundraiser at Gehrig Sporting Clays Course. We can host bachelor parties and corporate outings. Our staff can help you plan an event including catered meals. It's sure to be the most talked about event of the year. Sporting Clays is often called "Golf With A Shotgun" and a shoot at Gehrig Farms is sure to be a great time for both the novice and advanced shooters. Do something different this year for your event or corporate outing.